We’re the debt experts you can trust. We’ve helped thousands of people get out of debt. 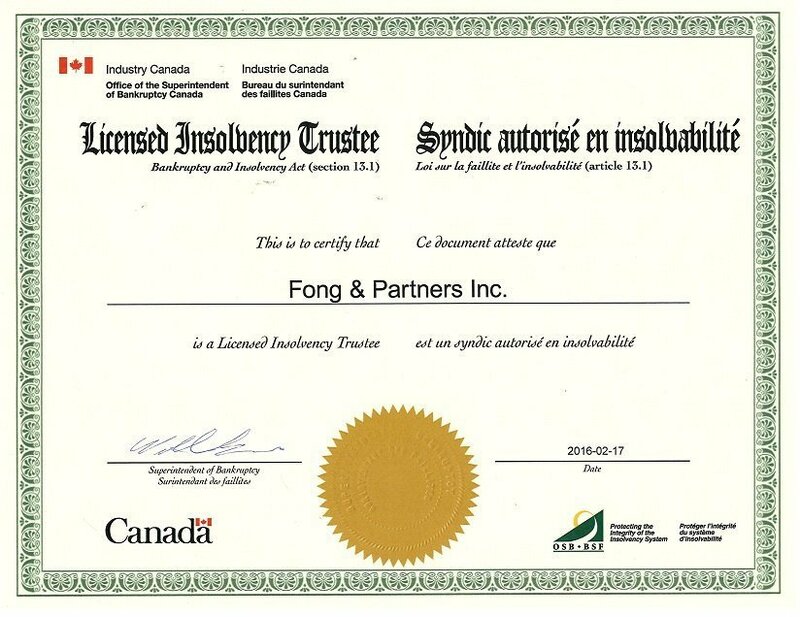 ThreeBestRated.ca awarded Fong and Partners Inc. its 2017 Certificate of Excellence. We’re an accredited business with the Better Business Bureau of Canada with an A+Rating. It’s simple: we help people get out of debt. Consumer Proposals – a legal settlement with your creditors. Personal Bankruptcy – to eliminate your debt and get a fresh start. We can help you with almost any debt-related matter, including lawsuits, wage garnishments and tax debt. "They will know the truth and the truth shall set you free." Personal Bankruptcy is a legal process that is designed to wipe out credit card debt, income tax debt, and other types of unsecured debts for people who can no longer afford to repay them. If you’re thinking about filing for Personal Bankruptcy, call us or submit our Contact Form for a FREE no obligation consultation to see if you qualify. How does a Consumer Proposal differ from Personal Bankruptcy? A Consumer Proposal allows you to legally settle your debts and allows you pay this settlement over an extended period using a court-approved, supervised payment plan that you can afford. Not all creditors need be paid in full and unpaid amounts will be discharged. 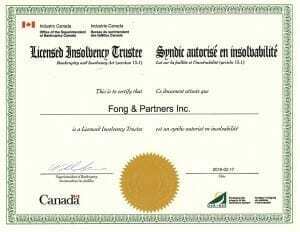 Schedule a free consultation with Fong and Partners to evaluate your eligibility. Why do people choose to file a Consumer Proposal over Personal Bankruptcy? Your assets won’t be affected. You’ll be able to start rebuilding your credit as soon as your proposal is approved by your creditors. Creditor approval takes takes 45 days from the date you file your proposal. How can filing for Personal Bankruptcy or a Consumer Proposal help with creditors? 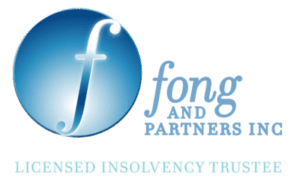 The minute you retain a Licensed Insolvency Trustee to file your Bankruptcy or Proposal, the Trustee will notify all of your creditors of your filing and tell them that they may no longer call you or write you letters. If your creditors continue to harass you after receiving notice of your Bankruptcy or Consumer Proposal, they are subject to sanctions by the bankruptcy court. Start now. Do I have to file a Bankruptcy or Proposal if I am in debt? No. If you can pay your bills when they’re due, it’s a good idea to do so. However, if your debts are significantly more than your assets and income, a Bankruptcy or Proposal might be your best option. Call us or fill out the Contact Form for assistance in making this decision. Can I apply for a new credit card once I have filed a Bankruptcy or Proposal? You need to surrender your credit card if you file for Bankruptcy. You can keep your credit card if you file a Proposal, but your credit card company will decide whether you can keep your credit card after you file it. If you have a balance on the card that you are trying to eliminate in the Proposal, that company will likely cancel your card. However, once your Proposal has been approved by your creditors (which only takes 45 days), you can apply for a secured credit card to start rebuilding your credit. Case closed. You’re debt free! “Due to some financial difficulty and unforeseen circumstances, my father and I had Victor look at the case. He was quick at replying to our emails, answered all of our questions and gave us great advice. I would highly recommend him!” – Jenny C.
“Victor made what could have been a bad situation a better one. He helped me with a better plan for managing my finances and moving forward. He actually cares about you getting out from the debt and “Starting Over”. This was really a great experience for me and changed my financial trajectory. Thanks Victor!!! [and Mary ;)]”- R.G. “I would recommend to anyone who needs to tackle their debt issues to work with this company. Victor and the staff were outstanding. You get all the information you need to help you develop a practical strategy to deal with your situation, all without judgement or tone. A perfect balance between understanding and professionalism all wrapped up in know how. If I could give more stars I would.” – Ashley B. “Victor is amazing!!! He has not only helped me with my finance issues, but my whole family. If it was not for him I don’t know what I would do. He is not only there to help but give you advice and guidance. Even when everything is said and done if I ever have any question Victor is always there to answer them. I would recommend Victor and Jenny to any one looking for help with bankruptcy and/or taxes. They really are the best you will find! !” – Jane R.
© 2017 Fong and Partners Inc. All Rights Reserved.